This book is one long challenge to most of the notions we received as part of our schooling and socialization. …It questions what being properly socialized means: is it being able to ignore the obvious signs of incipient collapse that makes you a well socialized individual? As the world, or at least many places in it, seems to lurch from one crisis to another, one may be forgiven about thinking about stability and the direction of things as a whole. I came across this book recently and found it surprisingly objective and cool-headed as it describes the end of the world as we know it. Orlov anticipates that unsustainable crises will really start to bite by the middle of this century. The financial, commercial and political systems will crumble, to be followed potentially by social and cultural collapse. 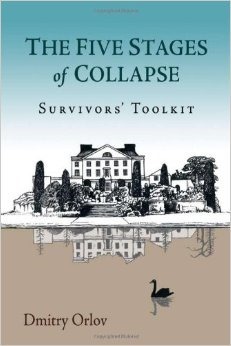 This is not a “survivalist” book about retreating to the renovated bomb-shelter with your shotgun so much as it is an attempt to describe the mechanisms of social decay in our way of life. It is survivalist in the sense of that being forewarned may help to ease the transition to the changes that are coming. I look around where I live on the west coast of North America which in many ways is one of the best places to live on Earth. But more and more, from transportation systems, to sewers, to water supply, to education (including the universities), to medicine, to communication, to food supply, I find I often whisper to myself: we can’t afford our infrastructure. In addition, there’s all the damage we continue to do to the land, water and air that sustains us. Over the years, I can see that I’ve been influenced by the thoughts of men, and women, who manage to find a place to stand outside the mainstream. There’s William Irwin Thompson, cultural critic and historian, who out of yogic meditation brought forth his critiques of academia and society. There’s author Doris Lessing, whose seeking led her to the objectivity of the Sufism of Idries Shah, and wisdom about humanity. Also there’s Wendell Berry, whose livelihood upon the land gives him an essential grounding that expresses itself in his poetry, prose and politics. I think of Thomas Homer-Dixon who found useful points of reference in the decline of the Roman Empire and the ecology of forests as a civilizational model to look at our society’s resilience, or lack of it. In the case of Dmitry Orlov, his perspective and independence of thought seems to come mainly from being ex-Russian. Orlov and his family left the Soviet Union in 1976, as part of a wave of emigration used by Moscow at the time to rid itself of undesirables and dissidents. Orlov has observed, and sometimes experienced, currency tribulations, widespread surveillance, the abuses of a police state, and the rise of a criminal/oligarchic class that has now largely integrated with the former KGB agents who currently run Russia. I’d like to run through a little of what Orlov has to say about each of his five stages of collapse. He includes fascinating case studies that highlight points he’s making, some of which I find disagreeable. The result of this first stage is that financial institutions become insolvent, savings are wiped out and access to capital is lost. Orlov’s point is that the global financial system is a mental construct which confidence maintains, and if confidence is lost, as we could see in 2008, it starts to unravel and fall apart. The financial system is a house of cards built on ever-increasing debt in order to grow. He sees usury (lending at interest) as the inevitably rotting root of the system. And so we see the collapse of the economies of sovereign states, such as Greece, on the large scale, and at a smaller scale, the bankruptcy of cities such as Detroit. The only remedy that central banks of any nation have is to print more money, which inevitably devalues it. We have seen this up-to-now slow process over my lifetime – a dollar now is worth much less than what it did in 1980, say. In the US, the dollar has lost 8000 percent of its value in the last 41 years, Orlov says. Orlov observes that although our economic system depends on infinite growth, once that endless growth fails to materialize, what then? He proposes storing value in real commodities although that has its limits. Are there alternatives to money that communities can create for themselves? He looks at barter and other systems of trading. Although he concedes he may be hopelessly idealistic, Orlov sees the ultimate solution in strong, extended families that pool all their resources and are presided over by elders, who band together and form a larger community and create self-governance by a council of such elders. The inevitable end of the fossil-fuel era, and the dream of never-ending expansion it engendered, will necessitate a return to older, smaller scale means of exchange between individuals, families and communities. Orlov uses the instance of Iceland which suffered a financial meltdown due to the events of 2008 and after, and then began to recover. Iceland is one of the few places in the world still small enough to have direct democracy rather than the degenerate forms of representative “democracy” many of us are subject to. Iceland’s approach was to let financial institutions go bankrupt rather than prop them up by printing more money. Orlov argues that Iceland made a heroic and wise decision: the failure of banks freed up resources for productive activities that benefitted the entire society. This review will go on much too long if I delve in depth on each of the stages, so I will just touch on highlights for the remainder. For the intelligence and general contrariness of Orlov’s thought, leavened by his good humour, I urge you to take a look at the book itself. Our commercial system has become one of increasing numbers of middle men, each scratching to take as much out of the money chain as possible. It too will not be sustainable. The so-called free market is based on a system of property law, a legal system able to enforce contracts and a law enforcement system that can deter economic crime. He ends this section with a case study on the Russian Mafia. In his discussion, Orlov makes a strong case for anarchism, despite our conditioning to see the typical anarchist as an antisocial and bomb-throwing terrorist seeking violent overthrow of the existing order. Orlov points out that as a student of nature, anarchism makes sense as a system of cooperation and can be seen everywhere among animals. He notes the Russian scholar Peter Propotkin’s writings on anarchic cooperation as essential to the success of many species. Governments are good at certain things, Orlov is very willing to admit: maintaining a national transportation infrastructure, a reliable post office, and a fast internet…. Orlov’s case study to conclude this section is that of the Pashtuns, who occupy a tribal area between Afghanistan and Pakistan. They continue to succeed in defying all the empires and nations that have arrayed against them over the past century – the British, the Pakistanis, the Soviets and most recently the U.S.
Their governance is semi-leaderless and self-regulating. Some of their governing methods date back to Athenian democracy or before. Orlov admires their hardiness and tenacity. He doesn’t mention too much about their ties to the Taliban and the related negation of the essential worth of the female population, which really can’t be seen as a survival trait. In Orlov’s view, it will be better to concentrate on a safe way to be, with others, rather than some imaginary, for most of us, safe place to go. Communities who already live with hardships of one kind or another will be more resilient than, say, gated communities of the affluent. Personally, organized religion appears pernicious, undesirable and unnecessary, but I can also see its utility in building and sustaining a sense of community. Orlov is not as strong in his thinking in this part of his book, and he admits to that. If we get to this stage, whatever happens after social and cultural collapse will be up to each of those who survive – there may not be a lot of useful prescriptions. His case study for social collapse is the culture of the Roma, the Gypsies of Europe and North America who have learned to survive in difficult circumstances. They are a nomadic and insular, even secretive people, but they are well-suited to thrive in a disordered, disorganized society. For a case study on cultural collapse, he cites the famous anthropological research of Colin Turnbull on an African tribe called the Ik, which Turnbull published in the book The Mountain People, in 1972. I remember reading that book many years ago, and being dismayed about the Ik’s profound abasement as a society and what it may show about ourselves. As Orlov says, the Ik are rugged individualists – to a fault. Their language is unrelated to any others in their vicinity, but has characteristics of Middle-Kingdom Egyptian. Under a permanent suntan, their skin is red not black like the surrounding African tribes. The Ik are a post-collapse society which has been under stress for many, many years. They were once nomadic hunters and gatherers, but various colonial and national authorities took their hunting grounds away from them and made them settle and try to subsist on barren land of no agricultural value. The result has been intermittent famine and starvation. Their language has lost all of its pleasantries and niceties. Their village compounds consist of concentric circles of stockades penetrated by small and cryptic openings as a defense against their closest neighbours. They seem to have almost no emotion except for occasional gruesome hilarity at the misfortune of others. They do their best to eat alone and in secret. Children are abandoned early and learn to feed themselves by watching baboons. The Ik show a way of surviving cultural collapse. It’s better not to have to go that far.